Danny Rose was once a player who Leeds United held up as a fine example of maturity and good judgement. These days, the opinion of him at Elland Road is not so reverent. As recently as March, his name cropped up in the match-day programme notes of United's chairman, Ken Bates, published before a League One game against MK Dons. "The saddest thing I read this week was that Danny Rose has gone on loan to Watford from Spurs until the end of the season," Bates wrote. "When (Tom) Taiwo and (Michael) Woods foolishly went to Chelsea, Danny refused...and stated that he loved Leeds. "Twelve months later he disappeared into the obscurity of the Spurs training ground. "These things should be remembered when parents are considering their son's future...fast buck now or long-term career prospects?" Two years after saying his goodbyes and completing a transfer from Leeds to Tottenham Hotspur, Rose is surprised to learn that his career continues to be so topical at a club he left without once representing their first team. His name-check in the most compelling section of United's programme was not his first, and it is unlikely to be his last. Rose, in Bates' opinion, made an error of some magnitude when in 2007 he decided that Tottenham were offering him what Leeds could not, disappointing a chairman who had openly championed the midfielder's attitude 12 months earlier. "Every now and again I get a phone call telling me that I've been mentioned by the chairman in his programme again," says Rose. "I wouldn't say it bothers me but it surprises me that I'm still being talked about, and it's a bit of a shame. When I left Leeds, I wished them well and I didn't want things to be bitter." The story behind Bates' dissatisfaction with Rose's quiet but acrimonious departure from Leeds is complex, involving two Premier League clubs, two other young players formerly on the books at Elland Road and the contentious issue of youth development. Rose's profile was first raised to a public level in August 2006 when United held a press conference at Elland Road to announce that they planned to report Chelsea to the Football Association over alleged illegal approaches for three of their more talented academy players. Two of those prospects – Taiwo and Woods – had already agreed to take up offers from Chelsea, but 16-year-old Rose slipped the net, choosing instead to take up a scholarship at Elland Road. Chelsea's recruitment policy infuriated Bates – the dispute with the club he once controlled was eventually settled at a cost of around 4million to Chelsea – but the retention of Rose in the face of Chelsea's invasion pleased him immensely. In future years, Bates claimed, the teenager would value the day he looked a Premier League club in the eye and said no. Three years on, Rose maintains that he was driven to his decision by the belief that a path to United's first team was about to open up in front of him. "In a way, turning down Chelsea was a hard decision, but I didn't feel at the time that I might be making a mistake," he says. "It was a hard call because I had a Premier League club trying to sign me, but not because I had any doubts about staying at Leeds. I honestly felt that I was going to break into the first team soon after. "I still think that if Kevin Blackwell had stayed on as manager for longer than he did then I'd have got my chance, but he was sacked quite early in the (2006-07) season and I didn't feel I got a look-in after that. "He seemed to rate me very highly and I'm sure he would have thrown me in sooner rather than later – or that's what I hoped anyway. "In the end, some of the other young lads climbed ahead of me and I wasn't too happy about that." Blackwell, United's former manager, named Rose among his substitutes for a League Cup game between Leeds and Chester City at Elland Road on August 22, 2006, alongside another promising youngster in Jonathan Howson. It was to be Rose's first appearance in the senior squad and also his last. By the middle of September, Blackwell had been evicted from his position as manager and Bates was on the road to appointing Dennis Wise as his replacement, a boss who was happy to use Howson, Tom Elliott and Fabian Delph among others but never found an opportunity to turn to Rose. The midfielder's exit was hastened and in part dictated by United's descent into administration in May 2007, a development which made every pound coin essential. Rose's transfer to Tottenham that summer was said to have raised around one million of them – a large sum for an insolvent club – but he did not leave with Leeds' blessing. Bates was rather disappointed that Rose's sense of belonging had waned. The 18-year-old does not agree that his transfer was motivated by a "fast buck", or that he sold his career down the river by agreeing to join Spurs. "I know the chairman (Bates) thinks I made a mistake, but he has to ask himself what he would have done in my position," Rose says. "It's easy to say that he'd have stayed where he was but I didn't get the feeling that I was going to get a chance at Leeds. "I guess there's always a risk as a young player that you'll get lost at a big Premier League club, but I'd rather aim as high as possible and miss out on my biggest ambitions than not try to reach them at all. "I've always wanted to be a Premier League player. 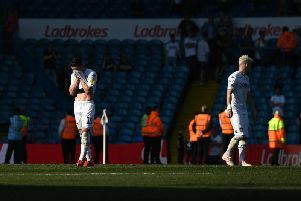 "At the end of the day, my transfer earned Leeds a fee at a time when they were having financial difficulties, and I felt it was best to move on. "It really wasn't about money and it definitely wasn't done to upset anyone but I'm sure a few people in Leeds were hoping I'd be forgotten at Spurs." News of Rose has been scarce since he parted company with United, but it is not true to say that he has vanish or drifted into obscurity. In his own way, the midfielder appears to be patiently thriving. The earliest stages of his time with Tottenham were hindered first by a broken leg and then by a knee ligament injury, but it is a mark of his ability that both Juande Ramos and Harry Redknapp saw more than a faceless youth-team player in Rose. He finished this season on loan at Watford, making seven appearances for the Championship club, and after his return to White Hart Lane this month, he was named as a substitute for Tottenham's Premier League fixture at Everton on May 9. Over the coming week, he will represent England's Under-19s in the qualifying stages of the European Championship, the finals of which are to be held in Ukraine in July and August. "I broke my leg in my first year at Tottenham which wasn't a great start but I do feel that I'm involved down here," he says. "Juande Ramos put me on the subs bench for a game against Sunderland and the new manager did the same against Everton a couple of weeks ago. "I'm pleased that I seemed to impress both managers when they came to the club. That's always the biggest challenge when things change. "Going to Watford was great for me, and I'd happily go out on loan again next season if the manager thinks that's best. "Coming here was all about playing football and I'd have liked to have made more appearances over the last couple of years but it's not a bad feeling to know that you're involved at a club like Spurs. Rose have travelled back to Yorkshire for three international fixtures this week, the first against Bosnia and Herzegovina on Wednesday in his home town of Doncaster. Group Six of the qualifying format also contains Scotland and Slovakia, and Rose will know by next Monday – the date of England's final game against the Scots at Bramall Lane –whether a trip to Ukraine will become part of his summer schedule. In terms of attraction, the Under-19s have serious competition on Wednesday, playing at the Keepmoat Stadium on the same evening as the Champions League final between Manchester United and Barcelona. Rose is still optimistic that the international fixture can draw in a sizeable crowd, among it his mother who has been told in no uncertain terms that she must miss the biggest of European games. "Anyone who comes along will get good value for money," says Rose. "It's all about up-and-coming youngsters and the standard of these games is usually very high. "We all want to qualify so they should be competitive as well. "Obviously it's on the same night as the Champions League final which might give a few people a dilemma. "My mum's a Manchester United fan, but if she's tempted to give my game a miss then she needs to get her priorities in order! I'm not having any excuses." Monday, June 1 v Scotland at Sheffield United FC (7pm).